Showee, another busy few days... Trying to pack as much into our last few days in Cape Town as we could! Let me tell you, this has not been a holiday. It was busier than staying in Joburg ... And I had to go to work everyday! Haha. It has made us think about doing this week-swap on a somewhat more regular basis tho. Maybe 3 or 4 times a year :) Let's see how it goes, shall we. Has been a bit of a hassle having my computer shipped for work ... But rumour has it I should be getting a laptop instead soon, which will def make it easier to up and spend a week in CT :D Only thing is finding someone to bunny-sit ... CollegeInstructor house-and-bunny-sat for me while we were away last week. And he'll be doing it again when we're off in Namibia for 10days in Apr/May. Handy, but don't want to take too much advantage of his goodwill. Anyway, as I said, we were busy! On Thursday it was all rainy in the afternoon and The Trucker & I were supposed to be heading for an early dinner at Cape2Cuba with my friend Liary. Due to the weather (and ensuing bad traffic), we moved it a bit closer to home and went to Jake's instead. I haven't been since before I moved to Joburg. I had the Asian Sampler Starter, which was delish. But then I was really not inspired by anything specific for my main. So I had their butternut & blue cheese parcels. Which were nice, but not spectacular. Was lovely to catch-up tho, and see her before her little boy arrives in a mere 5weeks! 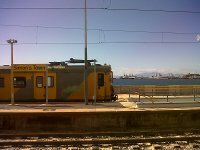 In the morning, the 3 of us headed into Simonstown for breakfast at Bertha's and the The Trucker & I hopped on a train to enjoy the sea-side journey back to Dad's house to get ready for the next wedding. I love that train trip, and I haven't done it since before I moved to Joburg either. It was a little disappointing tho because they've removed all the nice seats in the 1st class / Metro Plus carriages (at least the ones we were one, did see some others still had it when we passed them). And they have awful windows now :( I understand wanting to try and control people climbing onto or off the train thru the window, but it does kinda ruin the journey :( I did see other carriages that now have split windows where the bottom & top portions both have sliders, so maybe that's a little bit of an improvement/compromise? The other sad thing is the spray paint over the windows (I don't honestly mind it so much on the carriages)... We spent the journey standing / kneeling on the seats to be able to see out and enjoy the sea view. 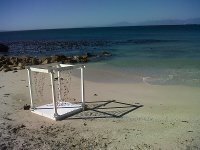 And then it was time to get dolled-up again, this time less so, for the Beach Wedding. We headed back to the Miller's Point beach with Daddio and waited for the ceremony. It turned out beautifully (we were all a little nervous about the wind & weather after the last few days & hopeful that the baboons wouldn't come thru!). They had a stunning set-up right on the sand. I thought it was beautiful. And this was the first bride I've seen wearing pants - haha! After the ceremony, we headed to the Ski-Boat Club for the reception. Going to so many weddings in such a short space of time makes you completely aware of how differently people can make essentially the same thing (a wedding). The 3 we went to were all so different from each other and lovely in their own ways and reflective of the couples themselves. I know it sounds obvious, but I guess it was highlighted by going to 3 weddings in 9 days! The Trucker & I spent Saturday night at the Beach Cottage again and then headed off to the airport. We got there early and were annoyed to discover that our plane was already delayed half an hour! Pfft. The airport seemed unusually empty for a Sunday afternoon too. We had time for lunch at the Wimpy and got home at about 6pm. Shew. It was nice to be back in my own house & own bed. Less nice to be back in Joburg traffic this morning. It's so weird. I was leaving the same time CT for a longer journey to the office, but the morning trips were such a pleasure there (the afternoons not so much!). Made me re-realise how packed & crowded Joburg is!